Home » News » Victoria’s “Better Apartment Design Standards” and noise – what does it mean for your site? SLR are excited to see the implementation of the Better Apartments Design Standard (referred to as the BADS), which aims to improve the livability and sustainability of apartments across Victoria. Of particular interest within the standard is the consideration of noise; in particular limiting noise intrusion into sensitive spaces such as bedrooms and living rooms. It considers noise intrusion, not only from other apartments (covered by the National Construction Code), and within the apartment complex itself, but also from external sources such as transport and industry. Internal noise limits have been placed on noise break-in from external sources. These noise limits are typically in accordance with the lower range internal noise levels recommended in Australian Standard AS2107:2016 (Acoustics - Recommended design sound levels and reverberation times for building interiors). The BADS identifies catchment areas where noise intrusion into sensitive living spaces needs to be factored into the building design. These catchment areas are based on proximity of the site to industry, rail and major roads. The catchment areas can extend as far as 300 m from transportation and industrial noise sources, meaning that within greater Melbourne and Geelong, over 400,000 land parcels are affected. However due to the screening benefits of noise barriers, buildings and in some cases the terrain, it is estimated that a large percentage of these 400,000 properties within the catchment areas will have external environmental noise levels that are unlikely to trouble the BADS internal noise criteria. Noise mapping of road, rail and industrial emissions can determine the likelihood of noise levels exceeding the standard. Noise maps calculate the external noise levels at every address throughout the region. Figure 1 is a section of a city noise map, showing noise levels calculated from a 3D computer model. Figure 2 shows the area covered by a city noise model for the greater Melbourne and Geelong region. SLR have studied a number of catchment areas and found that the number of sites where noise needs to be considered in the façade design may be much smaller than initially thought. If an assumption is made that 6 mm float glazing for windows and balcony doors is considered a minimum ‘norm’, and using a typical 5 m x 4 m living room with 10 m2 of glazing (balcony door and window), an external daytime traffic noise level of up to 60 dBA Leq,8hr may be permitted prior to any upgrade in performance being required to meet the internal noise target of 40 dBA Leq,16hr. In the example in Figure 3 below, the total noise catchment area (300 m from the road) along with the 60 dBA Leq,8hr noise contour is shown. This demonstrates that the number of buildings or sites within the 300 m catchment area is significantly more than that within the zone where noise needs to be a determining factor in the design. 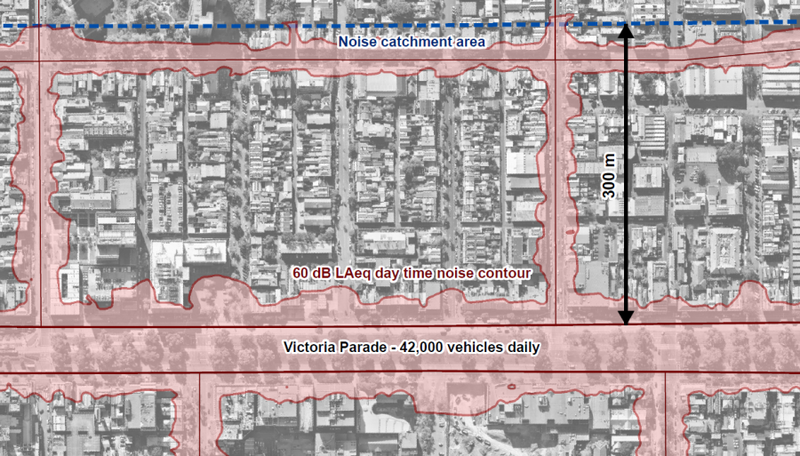 Interestingly, Figure 3 also shows that in addition to the primary road causing the 300 m buffer zone in accordance with BADS (Victoria Parade), noise levels exceeding the ‘trigger level’ of 60 dBA Leq,16hr­ are also generated on smaller roads which would not otherwise fall in to a BADS noise catchment area. In order for a road to generate a catchment area for the noise requirements of BADS, it must have an Annual Average Daily Traffic (AADT) of 40,000 or greater. SLR’s screening tools have shown that residential developments along many roads that carry less than 40,000 AADT will require glazing upgrades to achieve suitable internal noise criteria. 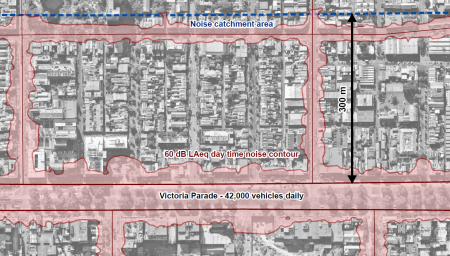 In the same catchment area shown in Figure 3, a site directly adjacent to and facing the main road (Victoria Parade) may be exposed to an external noise level over 70 dBA Leq,16hr. In order to meet the internal noise criteria of BADS, the same living room, as assessed above, would require much higher performance glazing. This typically excludes the use of large balcony doors facing the road (unless “winter gardens” were used in the design). Glazing requirements to mitigate such high noise levels may be wide-airspace double glazed windows or similar (well sealed “jockey-sash” arrangements). The Victorian Government Better Apartment Design Standards (BADS) provide welcome clarity in the area of providing suitable internal noise guidelines for quality residential developments. The number of dwellings where noise intrusion is to be addressed is likely to be considerably lower than the number of dwellings within the defined noise catchment areas. Conversely, a large number of residential developments front roads with traffic flows lower than considered eligible for BADS. Dwellings fronting busy roads outside of the BADS noise catchments may require additional noise abatement treatments (e.g. glazing upgrades) in order to provide a comfortable living space in accordance with AS2107:2016 “Recommended design sound levels and reverberation times for building interiors”. The use of noise mapping and geographical information systems can be used to screen potential apartment sites for the likelihood of costly noise abatement treatments (e.g. glazing). This exercise can be undertaken at the early planning stages of the development to increase cost certainty prior to a detailed assessment being undertaken. The same tools can also be used to provide an indication of glazing requirements for sites exposed to high noise levels, again at the early planning stages of the development, to increase cost certainty prior to a detailed assessment being undertaken. SLR currently has the tools to undertake this work in the whole of the greater Melbourne and Geelong area. We are nearing completion of noise maps of other Australian capitals to provide similar services to our clients throughout Australia and ensure we remain at the forefront of acoustic advisory services.